The Advisory Board and physician members of the Clinical Institute at St. Joseph Hospital would like to invite you to join us in our quest to provide the highest quality of care and outcomes for our patients. 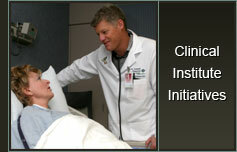 The Clinical Institute was created to address the needs of multiple parties: physicians, the hospital, and patients. The Clinical Institute is a professional organization of St. Joseph Hospital physicians who agree to practice the highest quality medicine utilizing Evidence-Based medicine practice standards and to document those quality outcomes so as to further enhance patient care. Our work will by Physician-Led, Evidence-Based and Data-Driven. Clinical Institute multidisciplinary teams have already started work on several clinical initiatives including Sepsis mortality, VTE prophylaxis, and Outpatient CHF/Diabetes. As we gain physician membership, these teams will excel in providing the necessary input and resources to truly effect outcomes. The work of the physician members of these teams will be greatly facilitated by team members in nursing, pharmacy, laboratory services, radiology, physical therapy, quality, and many other support services. The benefits of CI membership include integration of infrastructure and resources so that independent physicians may develop protocols, "best practices" and various other organized processes to allow you to provide high quality care in a more efficient manner. Coordinated care can enable physicians to perform well in public reporting initiatives and provide the means whereby you can obtain greater efficiencies and potentially improved reimbursement in recognition of the increased value of well-delivered and effective care. The ability to have greater access to information technology will also allow physicians and Saint Joseph Hospital to employ systems that better enables all parties to work together to improve the quality of care. Please feel free to log onto our website, www.clinicalinstitutesjo.org or contact me, or my assistant Kristin Taylor at 714-568-5550 with any questions. The website describes our charter and addresses the requirements for membership, governance structure, and our Clinical Institute teams. A membership agreement form to facilitate enrollment is available by clicking here. Thank you for taking time from your busy schedule to consider membership in the Clinical Institute at St. Joseph Hospital. Working together, we can use the best resources to ensure the highest outcomes for our patients. The Clinical Institute is open to any St. Joseph Hospital medical staff member who agrees to abide by the Institute’s Guiding Principles. Develop clinical best practices to improve outcomes (e.g., clinical pathways, standard order sets, evidence-based clinical tools). Advocate for implementation of best practices at all appropriate committees and with hospital leadership to ensure resource commitment. Oversee the development and/or implementation of enabling technology for data collection and reporting. Develop educational programs to advance best practice medicine. Practice good citizenship behavior and appropriate professional/collegial behavior, to include meeting attendance, committee participation. Accept assignment on committee of the Clinical Institute up to 2 hours per month, or up to one meeting per month. -- will mirror the specific requirements of the Medical Staff department with the exception of attending one of two CI seminars per year. Members will follow standardized clinical guidelines for their patients. Members will support the Clinical Institute pledge and will have fulfilled all requirements. Members will have continual clinical outcomes at the level of established goal. Members are re-evaluated annually for 3 years, then bi-annually. 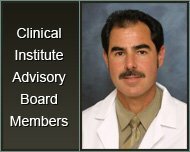 Membership termination is at the discretion of the Advisory Board of Directors of the Clinical Institute if the aforementioned criteria are not met.